Called the Northern Lights Task Force, it’s already coordinating communications and resources with Enbridge, the story said. Hundreds of officers have already taken trainings on how to respond to civil disobedience. 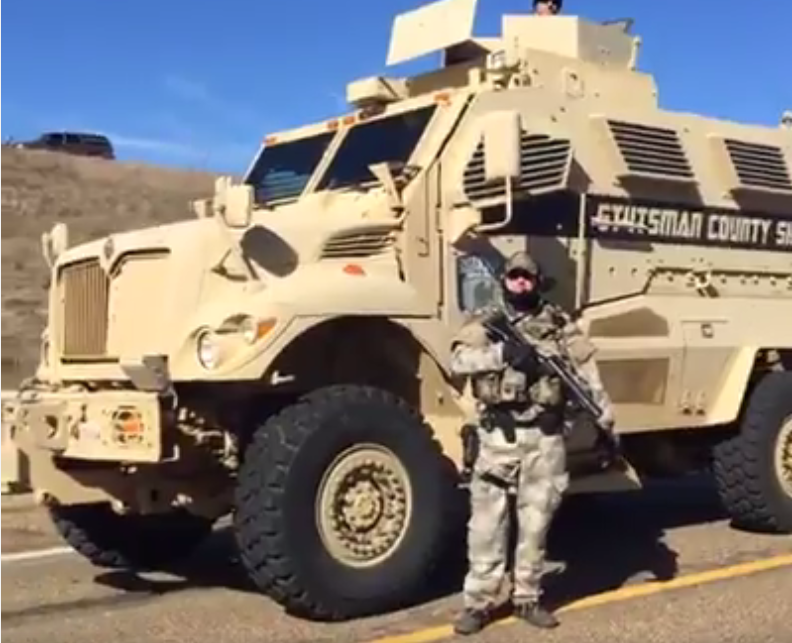 Screen capture of video showing the heavily militarized response to water protectors near Standing Rock. Is this “best practice”? Is this Minnesota’s future? The question is: Is this a prelude to the type the law enforcement coordination with Energy Transfer Partners at Standing Rock? As protests against the Dakota Access Pipeline (DAPL) ended in 2017, North Dakota Sheriffs and Highway Patrol officials began giving seminars advising agencies around the country on how to prepare for pipeline protests. North Dakota police leaders are now presenting themselves as trusted protest experts, based on their experience deploying Mobile Field Force teams to repress pipeline resisters at Standing Rock. Just to recap: Enbridge Line 3 is a new and larger pipeline than the old and failing Line 3. The new pipeline would cross 337 miles of northern Minnesota, much of it in a brand-new corridor. It is unnecessary and highly risky. The new Line 3 would cut through forests and wetlands, crossing the Mississippi River twice. Spills would damage Minnesota’s clean waters and wild rice beds. The project would violate treaty rights and add $287 billion in climate damage over three decades. The Minnesota Public Utilities Commission approved Line 3 last year in what was a deeply flawed decision. The Minnesota Department of Commerce and other organizations are suing in the Minnesota Court of Appeals to stop the project. A looming question is whether the Court of Appeals will allow Enbridge to begin “pre-construction” work while litigation is pending or impose an injunction. If construction is allowed — such as clear cutting a new pipeline corridor — Enbridge would do long-term environmental damage before the court’s ruling. Such action would surely spark civil disobedience along the route and in the metro area. Great job by Unicorn Riot. Click here for the full story.